A woman who was involved in a fatal collision last week was on her way to a funeral at the time, a close family friend has said. Jean Osborne, an 80-year-old pedestrian, was hurt in a road collision on Tuesday. The PSNI announced at the weekend that she had died on Friday. The incident happened on Plantation Street in Killyleagh, Co Down. DUP councillor William Walker, who hails from the town, knew her well; her son Brian was the councillor’s best man. Mr Walker said Mrs Osborne had been a regular attendee at the town’s 2nd Presbyterian church, and been on her way to the funeral of a parishoner, Oliver Priestly, when the crash happened. Though he cannot be certain, he believes the driver involved may have been heading to the same funeral. He stressed his condolences, and those of Killyleagh at large, go out to her surviving family. She had three children, Brian, David, and Anne, and was a grandmother. He said her funeral is expected to take place in 2nd Presbyterian at 2.30pm on Tuesday. 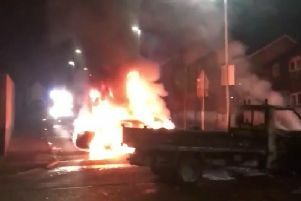 The PSNI has issued an appeal for witnesses to contact investigating officers by calling PSNI Downpatrick on 101, quoting reference number 522 of 15/01/19.